It is said that if scientists, notoriously outstanding in one field, try and branch out into another one, they almost always come up with something worthwhile. It is also said that crosspollination is good for nature as it breeds new species. Thus, if metal musicians, well established in one genre, put together a new band to play something else, it must be good for advancement of metal as a whole. More pertinent question is, at least as far as a listener is concerned, would the music be worthwhile? Candlelight and its partners (Regain Records out of Sweden being one of them) tried to answer this question three times this year. Superfamous Norwegian black metallers getting together to play commercial rock had a respectable, but no so breathtaking, result with Audrey Horne and absolutely unlistenable punk concoction known as Scum. 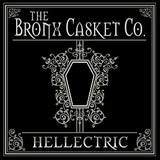 To be 100% honest, Bronx Casket Co. is not a totally new entity, with the couple of albums behind them before Hellectric, but this band is the answer whether US thrash and traditional metal masters can create dark gothic rock. I have to say that music of Hellectric is the last thing I expected to come out from the pen of DD Verni. If I have to explain to you that DD is the bass player and one of the masterminds of Overkill, then something is really missing from your metal collection. Getting Tim Mallare (also Overkill) to drum for BCC was probably easy, but DD got a group of other good ol’ Jersey boys to contribute with Jack Frost (Seven Witches) doing guitars and Michael Romeo (Symphony X) to help with production. Hellectric is as far from Overkill as North Pole is from the South. DD wanted to play gothic rock with Bronx Casket Co. and he certainly succeeded. Type O Negative would have been proud of immediately catchy dark melodies and synthetic orchestration in Little Dead Girl (a good choice to turn into a video), Live for Death and Sherimoon, so sensual and scrumptious, it is almost animalistic, given the support of DD’s hungry bass undertones. These songs are almost begging to be played somewhere on Gothic Rock Radio, if there is one. Not just trying to go after a few commercial hits, BCC has quite a few droning, almost doomy songs on the album as well. Everything I Got, Motorcrypt, Can’t Stop the Rain impress with heaviness, especially in the rhythm section, and dredgy reverberating guitars. Not all moods on Hellectric are totally dark, however, as Dream of Angels (title fitting) is almost TSO-like, or I am still too much in the Christmassy spirit. Let My People Go is also a little different, almost theatrical, at times symphonic power metal, with its obvious Middle Eastern motif and the riff melody I know I have heard somewhere before, but can’t place right now. Myke Hideous/SpY (ex-Misfits) must be feeling right at home, as he is asked to deliver those very clean, but sneaky and slightly sinister vocals he is known for. Apparently, as any respectable gothic album has to have these days, symphonic effects and female vocals are also in order as Bleed With Me and Can’t Stop the Rain illustrate. Those are probably necessary attributes in the genre, but to me they dilute the otherwise meat-and-potatoes approach. DD manages to stay completely away from the icky syrup of the Finnish variety (To/Die/For and Entwine), but those guys know how to make a quicker hit. In My Skin and Can’t Stop the Rain are starting to drag towards the end of the album where all songs hover around 5 min. Where Hellectric stands head and shoulders above the crowd is its sound, crystal clear, but powerful and bottom heavy, with just enough reverb. What is very much of note is Lynyrd Skynyrd’s cover of Free Bird. I give you a bet you would not recognize it before the world famous chorus, and some of you, our fellow younger readers, will not even know that this song is as old as yours truly. Three times as long, and played four times slower than the original it takes on a creepy crawly feeling with all of the distortion, electric piano and outro solo. Mad thrash scientist DD Verni went out into the left field with Bronx Casket Co. I will leave it up to you to decide whether Hellectric is the gothic rock album you can’t be without. Either way, it was a very interesting listen for me.